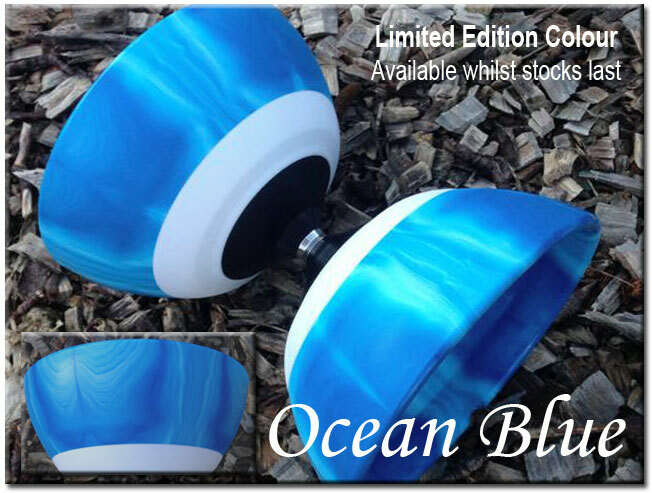 ''Ocean Blue'' is the 2018/19 Xmas Limited Edition version of the Sundia Evo G2 Diabolo which also marks the 20th Anniversary of Sundia Diabolos. The colourway was inspired by the ocean waves with its deep blue and swirls of white surf. Each cup has an individual pattern so every single diabolo is slightly different. Very limited numbers of this colourway were produced, and most were reserved for sale in Taiwan so these will be very hard to find outside of Asia. 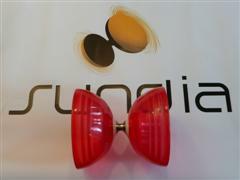 Other than the special colour this is the same spec as the standard G2 Evo diabolo. You can add 16g by swapping the normal stability ring for the weight ring or remove 18g by using the self locking plastic washers instead of the metal washers (or both). Ability - All levels - Due to the low weight and high stability this diabolo really is perfect for beginners / kids and professionals alike. As these are handmixed and each cup is unique, the overall colour varies from mid to dark blue with lighter blue swirls and waves through to light blue with darker blue swirls and waves. The exact colour you receive will be randomly selected from the box. If you would specifically prefer lighter or darker ones please let us know by email and we''ll do our best (stock permitting).